I’m back from Fantasycon, the annual beano hosted by the British Fantasy Society, which was one of the best events for several years, and had a great turn-out. I had some wonderful moments and the great pleasure of hearing Brian Clemens, writer of The Avengers, talk about his work. Expertly hosted by Steve Jones, this was the highlight of a terrific weekend. If any of you are anxious to get published in the horror/ fantasy/ SF/ edge areas you should really think about becoming a member, because it’s how a great many authors have started their careers…the events is attended by newcomers, high profile authors, publishers and booksellers alike, and everyone talks to everyone else. Check out the BFS site here. The event was once more held at one of the world’s most horrible hotels, the Britannia. This is the same hotel which was undergoing ‘regenerative construction’ last year, isn’t it? 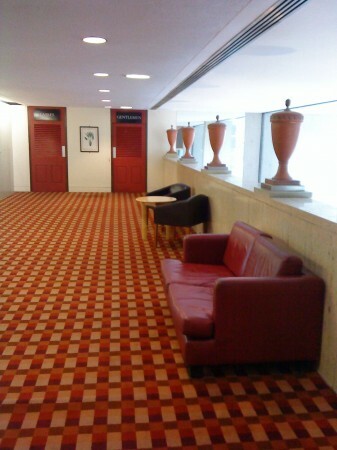 The urns are new, as is the glass preventing you from falling into the lobby and needing one of the urns. 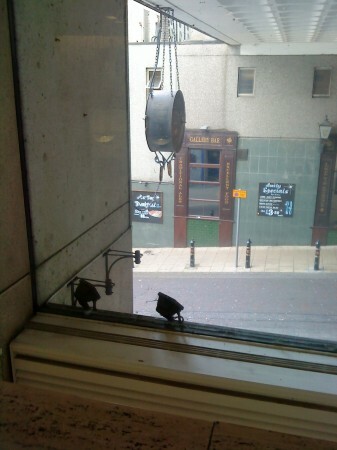 And what’s that… thing… hanging outside the reception window? Is it a clock counting down to the end of your life? well, at least the route to the filthy toilets is clean…. and, that thing hanging outside the reception window, looks like the perfect setting for a story involving a body hanging from it….